A Great Dish For The Holidays! our popular low-sugar cranberry sauce. I can't get enough of fresh cranberries and pomegranates. Just knowing they will soon be gone makes me appreciate them even more. Here's a variation of our popular low-sugar cranberry sauce recipe with the addition of pears and cranberries. It was a big hit at Thanksgiving and it could be a great addition to your Christmas menu too! Serve it with roasted root vegetables, stuffed acorn squash, rice casserole, on top of a baked sweet potato, with vegan stuffing, or just eat it with a spoon. It keeps well so you can make it early in the day or even the night before. To remove the arils, see my post on how to neatly clean a pomegranate and set aside the pomegranate arils. After grating what you need from the orange peel, cut the orange in half. Squeeze the juice from both of the orange halves into a 1-cup measuring cup. Fill the rest of the measuring cup up with water. Place in a small saucepan with the orange peel and sugar. Heat on medium heat, stirring, until the sugar dissolves. Add the cranberries and bring to a boil on high heat. Reduce the heat to medium-low and cook, stirring occasionally, until the cranberries pop and the sauce thickens, 8 to 10 minutes. Add the pear and cook for another minute or two, stirring frequently. Remove from the heat and add a few drops of stevia at a time until the sauce reaches the desired sweetness. Be careful because too much stevia will actually make it bitter. Stir in the pomegranate arils. Place in a serving bowl, cool to room temperature and serve. Per serving (10) 81 calories, 0 g total fat, 0 g saturated fat, 9 mg omega-3 and 42 g omega-6 fatty acids, 0 mg cholesterol, 1 g protein, 20 g carbohydrates, 3 g dietary fiber, and 2 mg sodium. Per serving (12) 67 calories, 0 g total fat, 0 g saturated fat, 7 mg omega-3 and 35 mg omega-6 fatty acids, 0 mg cholesterol, 1 g protein, 17 g carbohydrates, 3 g dietary fiber, and 2 mg sodium. Go Nuts For Nuts - You'll Live Longer! Eating nuts can lengthen your life! Occasionally you'll hear someone promote a food that could improve your health and possibly extend your life but often it's not something you would want to eat everyday. Cholorella and spirulina come to mind. Or, it's not something you have easy access to like goji berries, for example. But a 30-year Harvard study recently revealed that plain old, easy-to-find nuts can help you live longer. * had an 11% reduction in deaths from cancer. There was also a linear relationship between how often people ate nuts and the amount of benefit they received. The more times a week they ate nuts, the longer they lived. * Those who ate nuts less that once a week had a 7% reduction in mortality. * seven or more times a week, a 20% reduction. Nuts are high in calories because of their fat content and I'm sure if you ate a pound of nuts each day you would gain weight. But the study found that regular nut-eaters were found to be more slender than those who didn't eat nuts. So eating a handful of nuts a day not only improves your chances of living longer but it can also keep your slimmer. So how can you take advantage of this good news? To take advantage of the many benefits of nuts, eat a variety of them, of course avoiding those you may be allergic to. Walnuts provide more omega-3 fatty acids, Brazil nuts are rich in selenium, almonds are high in vitamin E, pistachios provide vitamin B6, macadamia nuts and pecans are rich in manganese as are most other nuts. So mix it up! I prefer to eat raw nuts because the roasting process can create carcinogenic chemicals. Some of the nuts that are sold as "raw" are actually blanched (like almonds) or exposed to high heats during the shelling process (like cashews). But at least they are not roasted in oil. Raw nuts, however, are high in phytic acid which can lower your absorption of minerals like, zinc, calcium, iron and others because it has a tendency to bind with them. If you are a raw foodist and nuts are a key part of your diet, this could be an issue. To prevent this, nuts could first be soaked, rinsed, and dehydrated. However, if you are only consuming an ounce or two of nuts a day, (which is all you really should be consuming to get health benefits) it's not a problem. I also prefer to eat unsalted nuts. I find that I can eat a handful of unsalted nuts but if they are salted, I want to eat a lot more. I cannot walk away from a bowl of salted pistachios! 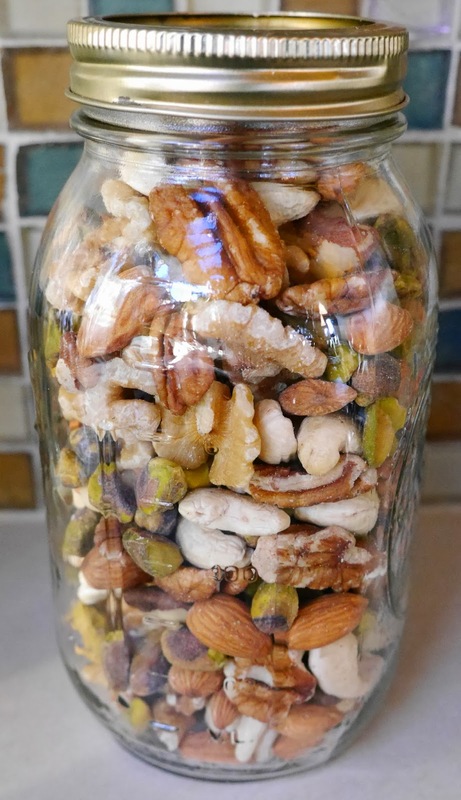 Because of their high fat content, nuts can go rancid so always keep them in the refrigerator. Make a mixture of your favorite raw, unsalted nuts. * Store in a glass jar and refrigerate. * Serve to your guests as an appetizer. * Put an ounce in everyone's lunchbox. * Put out a bowl for family "grazing". * Sprinkle nuts on top of green salads and fruit salads. Mix all ingredients and store in a glass jar. Refrigerate until needed. Enjoy a serving a day! Per serving: 188 calories, 17 g total fat, 2 g saturated fat, 505 mg omega-3 and 5,692 mg omega-6 fatty acids, 0 mg cholesterol, 5 g protein, 6 g carbohydrates, 3 g dietary fiber, and 1 mg sodium. 1/4 cup servings in your family's lunchbox every day. These are some of my favorite things for a healthy kitchen! I'm always buying things for my kitchen and I especially love buying these kinds of gifts for people who enjoy cooking - especially young adults who are just starting out. When you buy an appliance, kitchen tool, or ingredient that allows someone to cook healthy meals, you are giving them the gift of longevity. I can't think of anything better than that. 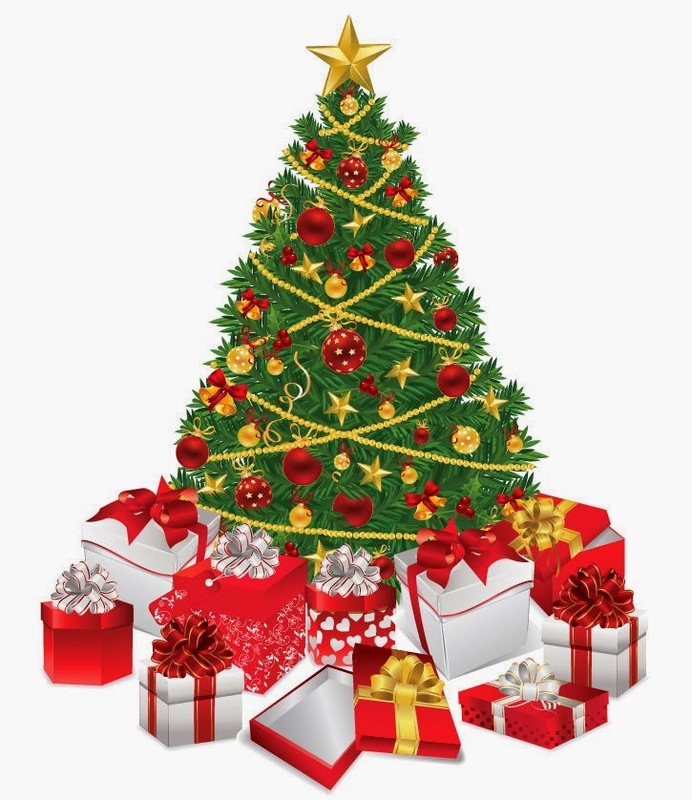 So if you are still making your Christmas list, you might want to include some of these gifts for your special someone. Or, feel free to put one of these under the tree for yourself! I've included links to Amazon because they generally have the best prices (and I hate going to the stores at this time of year) but if you can find these items locally, that's always a great way to shop. All cooks need a good knife. This 4-inch Stainless Steel Paring Knife is a good start. A nice serrated edged knife is needed to cut tomatoes, like this 5 1/2 inch Tomato Knife. 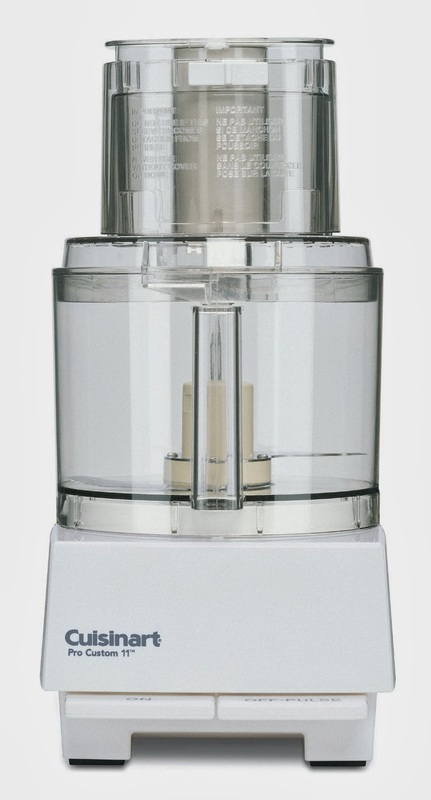 A good high-speed blender is my most important appliance. 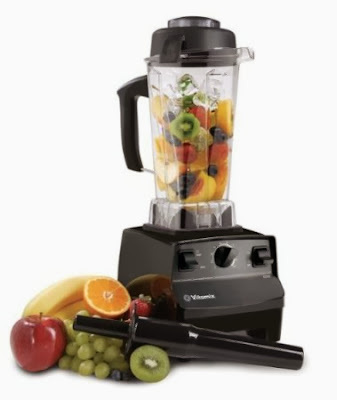 My favorite is the Vitamix. I have given one to each of my children. They are used for making healthy smoothies, raw and cooked blended soups, dips, nut milks, salad dressings, the preparations for healthy frozen treats, non-dairy "cheese" sauces, hummus, cashew cream, and so much more. They can even be used to make your own flour and to grind nuts and seeds. The Vitamix 1782 TurboBlend, 2 Speed, is the less expensive model and works great. 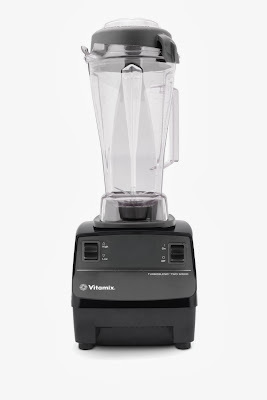 If you want one with a variable speed, get the Vitamix 5200. 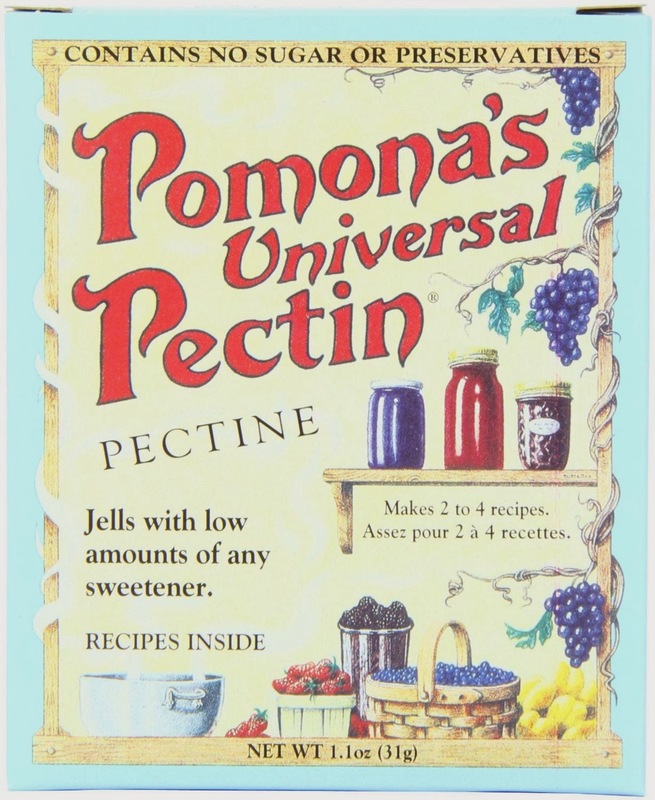 Here's a stocking stuffer for anyone interested in making healthy jelly and jam. 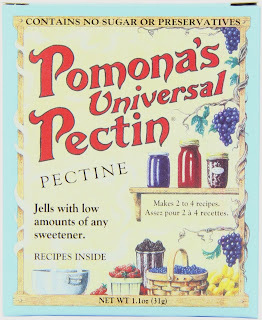 Pomona's Universal Pectin allows you to make jelly and jam with little or no sugar. It's a must for those who like to can! I love this product so much I devote an entire chapter to it in my eBook. The healthy way to make jelly and jam! Every chef needs a high-quality 5 1/2 quart Dutch Oven (or as Le Creuset calls them, "French Ovens".) For years I used non-stick Dutch ovens but the non-stick coating tends to scratch and can become toxic. I also adore my All-Clad stainless steel pots. 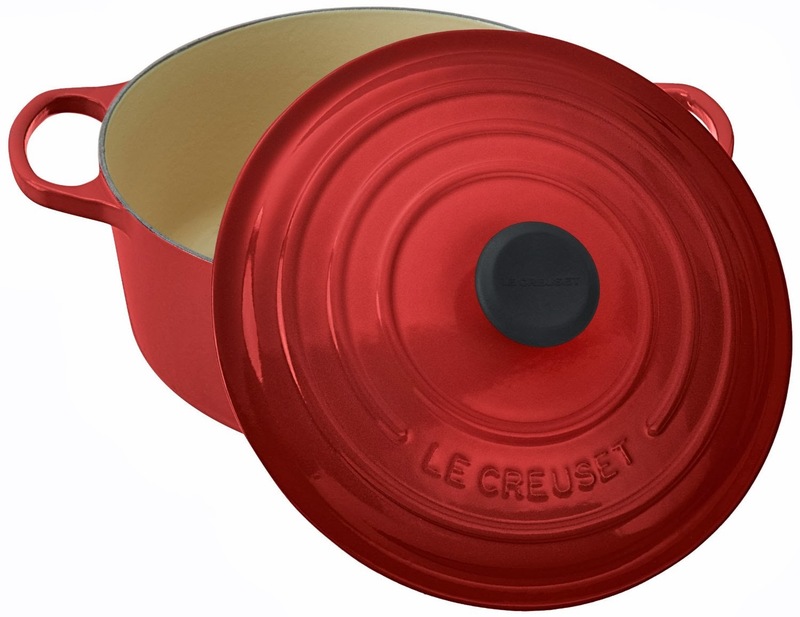 But my life changed when I finally broke down and bought my Le Creuset Enameled Cast-Iron 5 1/2 quart French Oven. At first I was reluctant to buy such a heavy pot (it's 11 pounds), but then I realized that using it served two purposes. Healthy cooking AND keeping fit! The enamel coating keeps food from sticking and makes it very easy to clean. It cooks evenly and will last forever. I use it all winter for making soups, stews, grains, and spaghetti sauce. It is truly a magnificent pot! Here's another very important tool that I use almost every day. It's a Microplane 40020 Classic Zester/Grater. I use it to zest lemons, limes and oranges. I also use it to grate ginger and garlic. It's so much more convenient than a big grater and cleans easily. It makes the perfect stocking stuffer! 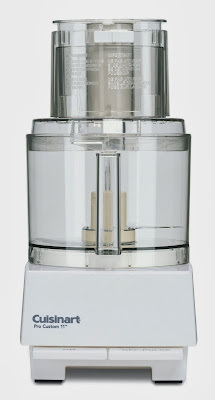 I absolutely adore my 11-cup Cuisinart food processor. 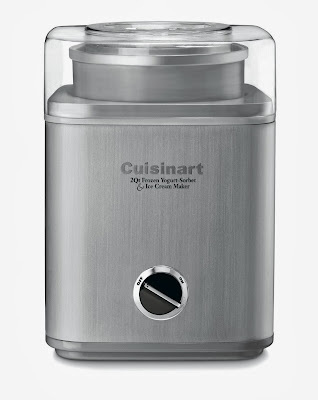 I use it to make raw pesto, hummus, raw walnut meatballs, raw chocolate truffles, pizza dough (or bread dough), and for shredding veggies for coleslaw or other salads. 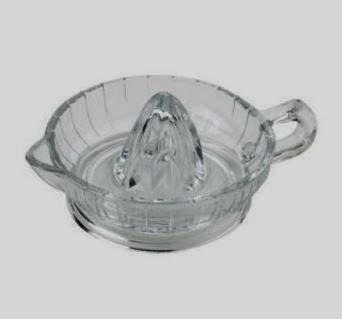 This inexpensive, glass citrus juicer comes in handy every time a recipe calls for fresh lemon or lime juice. I use it all the time! What's more fun than making ice cream or sorbet - especially when it's healthy and you get to control what's in it! I make all kinds of concoctions in my Vitamix and then toss them into a my Cuisinart 2-Quart Ice Cream maker . In about 20 minutes I have a healthy, non-dairy frozen dessert! 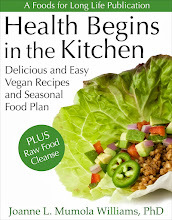 My eBook, Health Begins in the Kitchen: Delicious and Easy Vegan Recipes and Seasonal Food Plan is a great gift for someone wanting to include healthy vegan recipes in their diet. From morning smoothies, to frozen desserts, these recipes will help you kick off the new year with delicious recipes that will help you get healthy and stay healthy without sacrificing taste and enjoyment. You get 160 vegan recipes (most are gluten free), 145 beautiful photographs, plus critical nutritional information, menus, and instructions and recipes for a raw food cleanse - all for only $9.99. Great For "Between Holiday" Weight Loss! and has less than 160 calories per serving! If you are trying to lose a few Thanksgiving pounds before your diet is once again challenged at Christmas and New Years, this fat-free vegan lentil and barley soup can help you out. It's rich is protein and fiber which really satisfies your appetite for only 157 calories per serving. If you're too busy Christmas shopping to cook, don't worry. This one step, one pot meal is easy to prepare. Make it on the weekend and heat it up for lunch or dinner during the week. A hearty soup with lots of fiber and protein can be very satisfying for people transitioning to a more plant-rich diet. Protein from plant sources is just as beneficial as protein from meat and dairy and doesn't contain the cholesterol and saturated fat. And meat doesn't contain any fiber, one of the most critical components of any diet. Barley: High in fiber, selenium, and manganese. as well as fiber, folate and manganese. Place all of the ingredients in a 5 quart Dutch oven or soup pot. Bring to a boil on high heat. Lower the heat and simmer, tightly covered, and stirring occasionally, until the lentils and barley are cooked, about 45 minutes. Add all ingredients at once. No need to sauté veggies in oil. 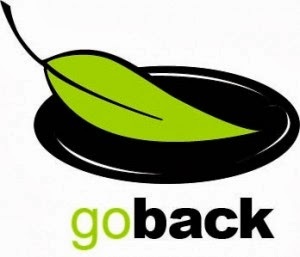 Always remember to remove the bay leaf. 7 grams of protein and 9 grams of fiber! Per serving: 157 calories, <1 g total fat, 0 g saturated fat, 28 mg omega-3 and 216 mg omega-6 fatty acids, 0 g cholesterol, 7 g protein, 29 g carbohydrates, 9 g dietary fiber, and 228 mg sodium. Did You Pick Your Lemons And Limes Before The Freeze? Here's What To Do With Them! An easy way to store lemons and limes. Pick those Lemons and Limes Before they Freeze! We are not buried in snow like many places in the country but we are having our first hard freeze in Northern California. Last night I was frantically pulling up all my lettuce, bok choy, and kale while Doug was pulling lemons, limes, and oranges off the trees. It's not too hard to juice and use up all the oranges but lemons and limes are a different story. Before juicing, you may want to save the grated zest. To do that, thoroughly wash the fruit. I would only do this if the fruit is organic. My favorite tool for this is a microplane zester/grater. But you can use a simple grater too. You can do this with lemon, lime, or oranges. You can either freeze the zest or dry it. You can dry it by spreading it out on a plate for a day or so or place it in a dehydrator. Once completely dry, you can put it in a jar. Here's a popular and easy way to save the lemon and lime juice. Juice the lemons or limes. Place the juice in an ice cube tray and freeze. Place the lemon or lime frozen cubes in a ziplock bag. Label and date them and place in the freezer. My favorite use for frozen lemon or lime cubes is to place one in a pot of soup at the very end of cooking. Many of my soup recipes call for the addition of an acid like lemon or lime juice to intensify the flavor. Lemon juice in hot water is a popular detox method as it helps cleanse the liver. Just add a lemon cube to a cup of boiling water and drink it first thing in the morning. You can do this more than once a day. It's a great substitute for coffee. And of course, when life brings you lemon cubes, make lemonade! Chocolate Makes A Great Christmas Gift! 1 pound bar of Hawaii's premier Criollo dark chocolate. Doug and I recently spent 10 days in Kona on the Big Island of Hawaii where some of my favorite foods grow abundantly. Papaya, avocados, and mangos are piled up in baskets at the local farmers' markets where they sell for one tenth of what we pay for them in California. What I didn't know, until this trip, was that some of the best cacao and chocolate I've ever had was grown and made right there in Kailua-Kona. We were lucky enough to be welcomed and given a tour of a very special chocolate farm and factory by owners Pam and Bob Cooper. Doug and I can totally relate to the Coopers. In 1998 we left our high tech jobs in Silicon Valley to start a whole new life - I devote my time to writing about nutrition, Doug works in his Pinot Noir vineyard, and we both have learned how to make delicious wine. Similarly, in 1997, Bob and Pam Cooper made a big life change. They left Raleigh, North Carolina, and bought a house in Kona that had some cacao trees. They didn't know it at the time but they would grow and produce the first 100-percent single-origin chocolate bar in the nation! 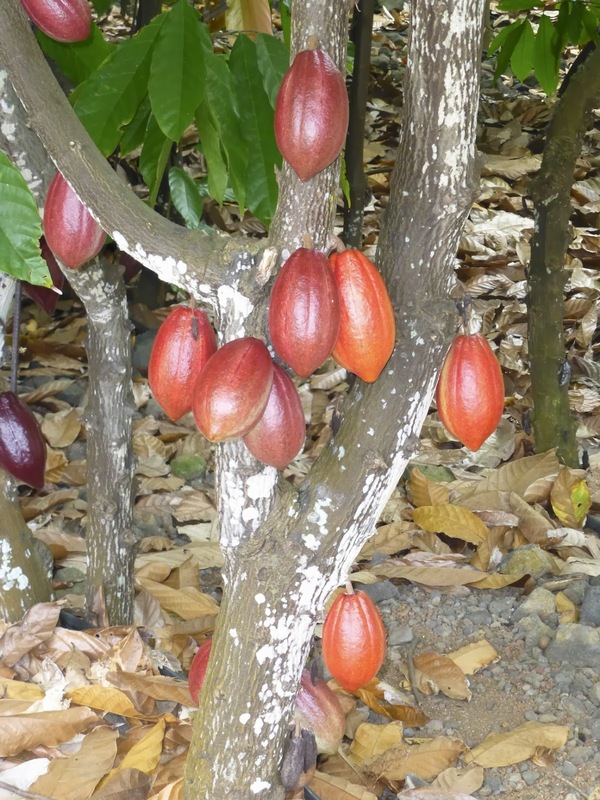 I'm sure other states would love to grow cacao but Hawaii is the only state in the "chocolate-growing-belt", a region that extends 20 degrees north and south of the equator. Although the farm consists of only a single acre of trees at his home and another 14 acres on the other side of the Big Island and the factory is perhaps the tiniest chocolate factory in the world, their product is mind blowing! Since I avoid dairy, I only sampled their two types of 70% dark chocolate. Although they were both delicious I especially loved the one that was made from the rare "criollo" cacao bean. Only 15% of the world's chocolate is made from this bean. Often chocolates that are this high in cacao, and their health-promoting antioxidant flavonoids, can be harsh and bitter. But their criollo chocolate is smooth with the richness of 70% dark chocolate but the smoothness of milk chocolate. I wasn't the first foodie to uncover this jewel. Evidently Alton Brown and other chocolate connoisseurs beat me to it. Doug and I at he Original Hawaiian Chocolate farm and factory . We really loved the tour and learned a lot about growing cacao and making chocolate. Here are some of the highlights of what we learned. Cacao pods, which contain cacao beans, result from the pollination of the blooms by little flies (I bet they are the same little pesky flies that were biting me and the family all week!). Pollination happens within one hour of blooming. The pods contain about 30 to 40 beans and take 75 days to mature. What was really interesting is that instead of harvesting once a year, as we do with wine grapes, they harvest their cacao continually - every two weeks when each pod is perfectly ripe. If they wait too long, the beans start to germinate inside the pod and can no longer be used to make chocolate. The pods grow from the tree trunk and branches and come in various colors. The beans are removed from the ripe pods and are covered in a thick, white, slimy material. During the tour, while Bob was showing us the inside of a ripe pod, four geckos immediately jumped on the table and starting eating this white covering. To a gecko, at least, this coating might be just as yummy as the chocolate! A gecko enjoying the white material covering the cacao beans. Having the geckos eat all of the white coating would take too long :-) so to free the cacao beans, they are put into fermentation tanks where the coating gets removed through the fermentation process. White coating is removed during the fermentation process. The beans are put onto drying racks which are opened every morning. The beans are then raked and culled to remove extraneous matter and immature beans. Flavors are locked in by roasting the beans in a coffee roaster. When they come out of the roaster, the beans still have their shells. The winnower removes the shell and breaks the bean into nibs. The winnower removes the shell. The conch is where the chocolate is actually made. This process takes 15 hours. First the nib is ground into a concentrated liquid called liquor. This takes 2 hours. All the rest of the ingredients are then added to the liquor and mixed very thoroughly for the next 13 hours. 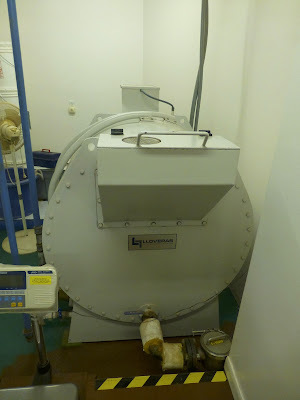 After the chocolate is finished in the conch, it goes into a holding tank where it is tempered. This process involves stirring the chocolate slowly while lowering the temperature from 120 degrees to 86 degrees. This stabilizes the cocoa butter crystals, gives the chocolate a satin sheen and a nice snap. It is then poured into various sized molds. They make individual bars, pieces in the shape of small or large plumeria, and 1-pound bars. shows how to mold the chocolate. They offer and ship individual bars or single hand-poured large Plumeria shaped pieces in regular dark chocolate, Criollo dark chocolate and milk chocolate. One pound bars and single hand-poured small Plumeria pieces are offered in regular dark chocolate and milk chocolate. You can also buy roasted cacao nibs that you can blend into smoothies or just eat as a snack. If you would like to receive this yummy chocolate by Christmas, Pam tells me that you need to have your order in by December 15th. We left with 2 pounds of this wonderful chocolate and we're savoring each bite. Thanks to Bob and Pam for their hospitality and for a very interesting and informative tour. If you are ever on the Big Island, make sure to go visit the farm. Their tours are very popular and get booked up quickly so schedule your tour in advance. Kale salad - a great way to include raw food in your winter diet. daily requirement of vitamin C.
When it's hot out, it's fairly simple to eat most of our food raw - raw salads, chilled soups - even raw crisps. And although we crave cooked foods when the temperature drops, like soups, roasted veggies, and baked breads, we should still consume a minimum of at least thirty percent of our food raw. Raw fruit or green salads can easily do the trick. 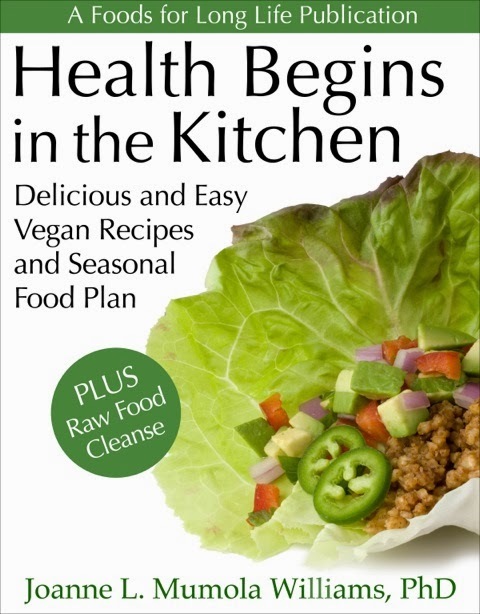 For details on my Seasonally Raw Food Plan that explains the optimal balance of cooked to raw foods throughout the year, including recipes and menus, download my eBook, Health Begins in the Kitchen - available on iTunes and Amazon. This simple salad makes a lovely holiday side dish and it keeps really well. So if you are looking for something fresh and colorful for your Thanksgiving, Chanukah, or Christmas menu, this could be it! Make the dressing by combining the lemon juice, oil, and salt directly in a large salad bowl. Place the kale in the bowl and mix until each leaf is well coated. Let the kale sit in the dressing to allow it to tenderize, about 15 to 20 minutes. Add the oranges, red onion, and pumpkin seeds. 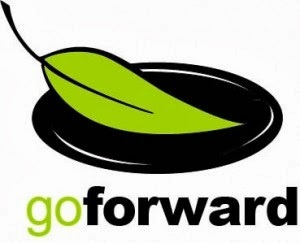 Toss well and serve. Per serving (with hemp oil): 104 calories, 6 g total fat, 1 g saturated fat, 539 mg omega-3 and 3,039 mg omega-6 fatty acids, 0 mg cholesterol, 3 g protein, 12 g carbohydrates, 2 g dietary fiber, and 381 mg sodium. Per serving (with olive oil): 104 calories, 6 g total fat, 1 g saturated fat, 117 mg omega-3 and 1,554 mg omega-6 fatty acids, 0 mg cholesterol, 3 g protein, 12 g carbohydrates, 2 g dietary fiber, and 381 mg sodium. Beware New Criteria That Greatly Increases Their Use! A week ago, a new set of guidelines were introduced that were supposed to help doctors assess their patient's risk of heart attack and stroke but best I can tell, it was just a way to push more statins on millions of perfectly healthy Americans. This should come as no surprise as the Amercian Heart Association and the American College of Cardiology, authors of the new guidelines, are heavily funded by the very drug makers that would significantly benefit from this change. Has the rate of heart disease increased? No. Have there been significant new studies published that demonstrated the benefits of lowering cholesterol? No. The only thing that has changed is the definition of who should take statins. The new guidelines say that treatment (or use of statins) is recommended for those with a 7.5 percent risk of heart disease over the next 10 years and can be considered for those with as low as a 5 percent risk. Previous guidelines recommended treatment for those with a 10 to 20 percent risk. The new criteria makes 31% of all adults "good candidates" for statins compared to 15.5% today. In addition to the expanded definition adding millions of new statin takers, the new calculator being rolled out is seriously flawed and can over predict the risk of heart disease by up to 150%. This means that millions more healthy people may be prescribed statins that would do them more harm than good! Unless a person has known heart disease, there's little that shows statins are effective in reducing the risk of death. In fact, popping a little pill might give people a false sense of security and discourage them from taking a more holistic approach that would include improving their diets, reducing stress, increasing the amount of exercise they are getting, or to stop smoking. Statin drugs cause many serious side effects. The most common is muscle pain. Although some only experience minor soreness or weakness, others can barely walk up a flight of stairs. And in rare instances, these drugs can cause rhabdomyolysis, life-threatening muscle damage that can cause significant muscle pain, kidney failure, liver damage, and death. Other side effects from statins include liver damage, digestive problems, memory loss, confusion, and can even cause blood sugar levels to rise leading to the development of type 2 diabetes. The identification of the serious flaws of the health calculator by Drs. Nancy Cook and Paul Ridker of Harvard Medical School prompted Dr. Steven Nissen, a past president of the American College of Cardiology, to ask that the rollout of the new guidelines be halted. Drs. Cook and Ridker demonstrated examples where a 60-year-old African-American man with absolutely no risk factors and a normal lipid profile and blood pressure was given a risk factor of 7.5 by the new health calculator. Other examples showed a healthy 60-year-old white male with an inflated risk factor of 7.5. Both of these men would have been prescribed statins for the rest of their lives. This may be good for the drug companies revenue numbers but not very good for these men who would be subjected to serious side effects. Despite what results from this flawed health calculator and these ridiculous new drug-promoting guidelines, as always I suggest you play an active role in your own health care. With drug companies pushing to get every man, woman and child on statins, you may get a lot of encouragement to go on these drugs. Although many experts believe that those who have already had a heart attack or heart disease can benefit from this drug, it is certainly not a drug that should be pushed on healthy people or people with low risk of heart disease who can mitigate this risk in other ways. More and more studies point to a link between inflammation and heart disease. Inflammation can be controlled with a diet rich in fruits, vegetables, whole grains, nuts, good fats, whole soy products, catechin-rich tea, red wine, chocolate, and spices like turmeric, ginger and others. In May I blogged about Dr. Andrew Weil's anti-inflammatory diet (not entirely vegan) which is a combination of the Mediterranean and Japanese diet. The best way to fight heart disease is to eat a healthy diet, get off the couch, stop smoking or don't start, and do things that you enjoy which will help you combat stress. No little pill is going to prevent the need to do these things and, in fact, may cause some serious health problems. As always, talk to your doctor (preferably a naturopath or integrative practitioner) before changing your diet or medication. Welcome To The 2013 Virtual Vegan Potluck! Brussels Sprouts - A Thanksgiving Favorite! Today's recipe will be part of the 2013 Virtual Vegan Potluck. At the bottom of the page, below my recipe, you will be able to link to over 100 vegan recipes posted by my fellow bloggers including appetizers, beverages, breads, salads, sides, soups, main courses, and desserts. So enjoy! Brussels sprouts and pomegranates are both Thanksgiving favorites so you can only imagine the joy on your guests faces when they are presented together in this delicious dish! There's a beautiful contrast between the smokey, roasted flavors of the Brussels sprouts and shallots and the bursting fresh flavors of the raw pomegranate seeds, which are actually called pomegranate arils. Arils are 72 calories per half cup. And in case you shy away from this beautiful, polyphenol-packed fruit because it appears to be impossible to clean, I will repost a very easy way to clean pomegranates - one that does not require a hazmat suit! Step 1 - cut off the top. Step 2 - Score the rind in four quadrants. Step 3 - Break the fruit apart, separating the pith from the arils, while submerged in a bowl of water. Step 4 - The arils will sink to the bottom. Skim off the pith and rind. Step 5 - Drain the arils and set aside. Lightly grease the roasting pan with a little olive oil. Prepare the Brussels sprouts. Cut 1/4 inch off the bottoms and rinse. Cut vertically in 1/4 inch slices. Place on the roasting pan with the shallots. Drizzle oil over the Brussels sprouts and shallots and season with salt, pepper, and garlic powder. Mix until they are well coated. Spread out the vegetables in a single layer. Bake until slightly golden brown, about 20 minutes, mixing the Brussels sprouts about half way through with a spatula. Remove from the oven and place in a serving bowl. Top with pomegranate arils, a squeeze of fresh lemon juice, and additional freshly ground black pepper if desired. Toss and serve. Per serving: 101 calories, 5 g fat, 1 g saturated fat, 108 mg omega-3 and 492 mg omega-6 fatty acids, 0 mg cholesterol, 3 g protein, 13.5 g carbohydrates, and 3.5 g dietary fiber.